Welcome to my new project called „Spread the love“. 2012 will be a very special year. The old ways of learning through fear and disconnection will vanish now and the new ways of learning through love and connection will come in more and more. Love is the key word to everything in our future. It heals, it embraces the dark, it nourishes the soul, it inspires and re-arranges, it gives you hope, it restores things, it makes you feel at home. 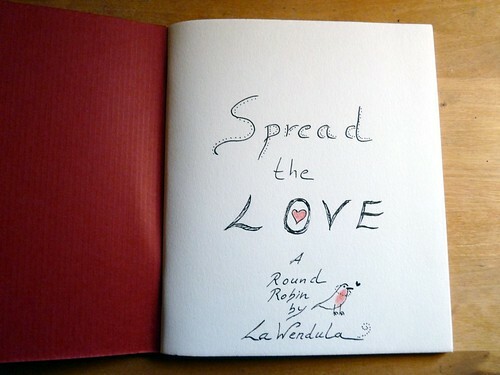 This little booklet is an artful project to spread love and make a sign for the new year 2012. Inside you can sign in and write the word love in your finest hand and in an artful way. You can also write down some wishes, doodle, introduce yourself, leave traces, tell us something, whatever. Then you take from others as much love as you want. Keep one for you and give the others to friends, family and even strangers. Put it behind a car’s wiper, drop it into a postbox, hand it over, leave it at a café, ad it to a letter, do what ever you like. You can sign up now, the beginning is on January, 1st 2012. There is only room for 15 “lovers”, if there will be more players, I will choose by random who will be in. Please sign in with an e-mail to lawendula@googlemail.com and please ad your mailing address.